I like to start the new year with things clean and organized. It feels good to start a new year with a fresh start. I like to get my spring cleaning done now because I have the time off from work and also because when it is actually spring, I'd rather be outside enjoying the beautiful weather, not cleaning and organizing. Not only am I a pin junkie, I'm also a magazine junkie. I get several magazines and I'm constantly ripping pages out to save ideas for later. I don't always get to read my magazines right away, and after a while they start piling up and looking unsightly, sloppy, and disorganized. 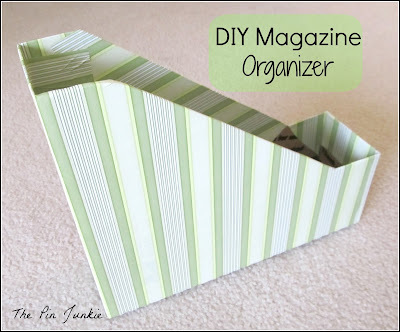 When I saw this pin on Pinterest, I knew that this would be a great fix to my overflowing magazine problem. This idea is from Lyssa Beth and if you go here you can get get the directions and measurements for cutting your boxes. She used Priority mail boxes that she got for free at the post office. I'm not recommending that you do this since I'm pretty sure using new, unused postal boxes for something other than mailing packages is mail fraud and I don't want to get you in trouble with the post office. You could use cereal boxes or some other box would work fine. Or maybe you have some leftover boxes from Christmas presents. Just make sure they are sturdy and all the same size and shape for a uniform look. I love inexpensive projects and all I had to buy was a roll of contact paper. I would have liked to get a prettier pattern, but the choices were limited at Walmart and this green was the best I could find. Now my magazines are organized and look much neater than they previously did piled on the floor! Great idea! BTW - I'm totally addicted to Pinterest, too! Stopping by from Just Something I Whipped Up @ The Girl Creative. Great idea! This has been on my to-do-list for a while now. Yours turned out super cute! That sounds like me, too! I hope this helps you organize your magazines. Happy new year and best wishes in 2013! I need some of these but did not want to spend the money or have ones that were not my style. This solves both problems :)Visiting from Debbie Doos. i love this look-i'm halfway there, lol, bc my stuff is in the boxes, but they aren't covered. good for you! very cute and ceative upcycle idea. stopping by from southern lovely :) going to follow your blog because I am ridiculously addicted to pinterest too, so why not add some more craziness! I love these. I'm going to do this. What a great way to do magazine holders. I have a link party called Wednesdays Adorned From Above Blog Hop and would love to have you share this and any other posts with everyone. It runs from Wednesday through midnight Sunday. Here is the link to the party. That turned out AMAZING!!!! I need to make some too! They look great! My daughters have just done this with cereal boxes! - such a good idea! These are great and they are very cute! Love the color. Thanks for sharing at I Gotta Try That. Have a great weekend. Great idea! They look so organized...and so pretty! Thank you so much for sharing it at SHOW-licious Craft Showcase! I just paid $5 for one on clearance at TJ Maxx. I could kick myself! Such a great idea!! Love it! I have a little box that we keep toy cars in, I think I may just cover it inside and out with contact paper. Oh, and an empty diaper box that we can re-use to hold new diapers! I made these last year and they look SO much nicer than the piles of magazines and paperwork waiting to be read! What a nifty thrifty idea...hope you come by on Monday and share it with us at my party. Your magazine boxes turned out beautifully--I really like them! Great use of the priority boxes.Yours turned out really cute. I've also spent some of Christmas break decluttering and re-organizing. It's so nice to start a year with a newly organized house. :) Great idea for magazines. I really need to sort through mine right now. Thanks for linking up at Romance on a dime! Was looking for something like this!! I have two plastic ones that will benefit from a face lift, and I can make a few extra from cardboard to match! Oh how I love my magazines. Just something about holding it in your hands, curled up on the couch and enthralling yourself into each and every page. I do the same rip out thing, but I have some that I just have to hand on to. I have lots of containers that I store them in, but this is a handy idea. I've always bought mine. Making your own is sure smart. Thanks for sharing with Share Your Cup. I'm the same way. It's just not the same reading the digital version of magazines. I pinned this idea months ago, but I never got to it. Congrats on actually doing it! I love the paper you chose. Great job, and thanks for linking at OneCreativeMommy.com. Love the price to make these!!! These are awesome and such a great organizer. I am a new follower! Follow me back!